Enhanced Ecommerce Tracking in WooCommerce is fairly simple in comparison to other websites, yet many people still face difficulties implementing it. To make it easier, we have compiled a simple, yet thorough step by step guide to implement enhanced ecommerce tracking for WooCommerce. As a bonus, we have also included an awesome DataStudio ecommerce template at the bottom. For free! To follow this tutorial I am assuming that you have a WooCommerce store and have installed Google Tag Manager using DuracellTomi’s plugin. The best practice to setup enhanced ecommerce is to create a new view and test before setting it up in the master view. If you have already setup enhanced ecommerce you will still be able to see the reports in the enhanced ecommerce reports. For enabling enhanced ecommerce tracking, open your wordpress dashboard and navigate to Settings >> Google Tag Manager. Go to integration, select WooCommerce and enable ‘track enhanced ecommerce’ checkbox. Click Save changes button at the bottom of the screen. Once you enabled enhanced ecommerce tracking from the wordpress plugin, it’s now time to verify if it is pushing the e-commerce data to the data layer. Navigate to console and you should see the data layer data as shown in the image below. If you are not seeing the data layer like the image above, open a product page, or go back to your wordpress and make sure you have saved the changes. Change the Enable Enhanced Ecommerce Features to true and check the Use Data Layer checkbox. Enter a name for your tag and save the tag. 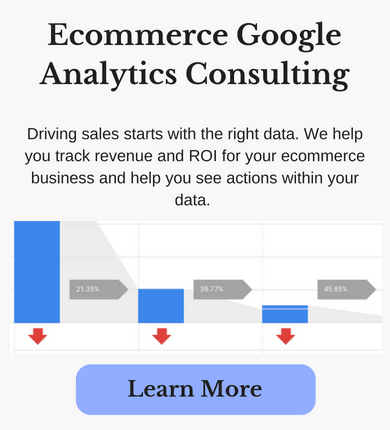 Once you complete the steps above, you will now be able to see ecommerce reports in Google Analytics within two hours. To verify your e-commerce setup, go to your website, and purchase a product, and check the ecommerce reports in analytics later. To view your ecommerce reports, navigate to conversions >> ecommerce >> overview. To see how visitors navigate through the purchase process, click on shopping behavior under ecommerce. To see the checkout behavior, you will have to add the checkout steps under ecommerce settings. Once you add the checkout labeling, you will be able to see the checkout behavior report under ecommerce. The final step is to implement the goal flow to understand the conversion funnel. The goal flow report will help you see the irregular purchase behavior. For helping you understand ecommerce data, we have created an ecommerce DataStudio template. Click on the link below to use this template and understand your ecommerce data.